Your molar has become sensitive to heat, cold and sugary foods. What’s happening? Contact Dr. Gary Klugman, Salinas, CA dentist. This highly-skilled family dentist is a Distinguished Mentor for the Center for Restorative Excellence in Seattle. Simply put, he knows if you have dental decay requiring treatment. A cavity is basically a hole in your tooth enamel. If deep enough, this decay may extend into the second tooth layer called dentin or even into the pulp which contains blood vessels, connective tissue and nerves. Left untreated by dental fillings, cavities often lead to substantial enamel damage and tooth loss. According to the National Institute for Craniofacial Research, tooth decay affects 92 percent of American adults to one extent or another. 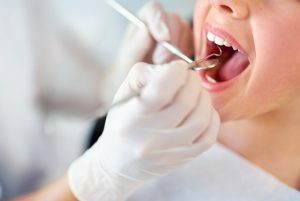 Your Salinas, CA dentist says that decay has its source in the foods we eat and in the bacteria which occupy our mouths. Sugary, starchy foods leave a sticky residue on tooth enamel and gum tissue. This residue is called plaque. Left to accumulate, it gradually hardens into tartar, or calculus. Both residues contain acid-secreting bacteria called Streptococcus mutans. The acid literally eats holes in teeth, and the bacteria also infects gum tissue in the form of gingivitis and periodontitis. The American Dental Association maintains that children through senior adults should brush their teeth with a quality fluoride toothpaste twice a day. Flossing in between teeth removes interdental plaque and residue at and beneath the gums. Dr. Klugman wishes to see all his patients twice a year for routine check-ups, x-rays, if needed and prophylactic cleanings, keeping teeth sparkling and clean. Also, routine dental care detects cavities at their earliest, making restoration easier and damage, less extensive. Your Salinas, CA dentist offers plastic sealants to coat deeply grooved molars and fluoride treatments to make tooth enamel more resistant to decay. Both kids and adult benefit from these preventive treatments. Eat a sensible, low-sugar diet. Stop smoking, if that is an issue. Drink water to keep teeth and gums clean and to increase saliva. Saliva keeps oral mucosa and enamel moist and free of bacteria. Amazingly, it’s a great acid neutralizer, too. Your Salinas, CA dentist at Blanco Circle Dental Care has many ways to restore dental decay. The most common is the tooth-colored filling. Natural-looking and durable, this composite resin material bonds directly to tooth structure and requires less preparation than old style metal fillings. More extensive decay may need root canal therapy, in which the soft tissue inside the tooth is removed. Dental crowns “cap” teeth damaged by multiple fillings, extensive decay or oral injury. Find them with your Salinas, CA dentist, Dr. Gary Klugman and his team. Contact the office if you suspect you have a cavity or simply want to arrange your routine exam and cleaning.